India is well known for its plentiful tea estates, and ubiquitous and addictive masala chai. However, in recent years, tea in India has started experiencing a revolution of sorts. The way tea is presented and packaged to the Indian market has changed a lot, with tea going upmarket. Contemporary tea cafes and shops have popped up all over India to complement traditional tea stalls. Here are some of the best ones where you can relax and enjoy a special brew, and taste and purchase various teas (including some rare ones). They're all vastly different, from classic to luxury. There's one thing they all have in common though -- an impressive variety of tea! Can't get enough tea? Take a look at the top places to visit tea plantations in India. You can even stay on a tea estate! "India Runs on Chai" and Chai Point makes sure there's plenty of it, selling more than 300,000 cups a day! The country's oldest and largest chain of tea outlets started out in Bangalore in 2010. It now has 100 stores in eight Indian cities -- Bangalore, Delhi, Gurgaon, Noida, Mumbai, Pune, Hyderabad and Chennai. There are plans to add another 50 by 2019. The menu is kept simple with a limited range of popular chai varieties such as masala chai, ginger chai and lemon chai. These varieties have been altered slightly for each region. For example, the addition of Sulaimani chai in Hyderabad. There are also some innovative items such as Masala Chai Latte. The chain sources the highest quality teas from estates in India, selected by professional tea tasters each season. It sells own range of loose-leaf teas as well. Most of the stores are designed to be modern and functional, with quick service in mind. This funky chain of tea cafes was founded in Delhi in late 2012, to provide people with the perfect cup of tea that's prepared specifically to their liking outside the home. The focus is “meri wali chai" -- that is, tea that can be customized by choosing from a range of popular ingredients (such as ginger, holy basil, cardamom, black pepper, and fennel). Even the amount of water and milk can be varied. The tea is made by special machines, called Chai Monks, to ensure consistency across every outlet. It's accompanied by Indian snacks meant for the local palate. All the stores are individually vibrant and quirky. There's currently about 70 of them, mainly in Mumbai and Delhi. The largest one is located at Mumbai airport to target global travelers. Tea Trails was launched in suburban Mumbai in 2013, with the aim of luring customers back from coffee lounges and educating them about tea beyond the standard chai. Prior to this, the owners spent two years researching and handpicking teas to suit the Indian palate. An enticing range of gourmet white, black, oolong, herbal and specialty Indian chais are served with snacks in stylish settings. The variety is greater than that offered by Chaayos. Nowadays, there are about 30 Tea Trails cafes across India. Regular tea festivals are special promotions are held. The first branch of Tea Villa Cafe opened in Mumbai in 2014. This sophisticated chain of tea cafes has also since expanded across India. Similar to Tea Trails, its young owners wanted to get India talking about tea and help tea culture regain its rightful place over the influx of western coffee chains (although coffee is available at Tea Villa Cafe too). The menu includes more than 100 variants of the world's best teas and 35 exclusive tea flavors (think Herbal Coconut Chai and Orange Blossom Oolong). In contrast to the other tea cafe chains, the food is predominantly European. It's vegetarian and freshly cooked on the premises. The fruit waffles are tempting for breakfast! Want to read while you sip your tea? Head to one of the Cha Bar outlets in Oxford Bookstores across India. The one in Delhi is particularly happening (located at N 81 Connaught Place, New Delhi, 110 001). The 86 types of tea, and tea blends, include hand-picked varieties from India and internationally. The Cha Bar in Kolkata is also great! A couple of friends started Tapri -- The Tea House in 2010 to serve the roadside (tapri) chai that everyone loves but in a clean and cool environment. It did so well that it broke even within six months! There are now three Tapri outlets in Jaipur (Tapri Pratham, Tapri Central and Tapri Ashram). They're so popular that you'll probably have to wait for a table on weekends. It's worth it though! In addition to a wide variety of teas (including exceptional Kashmiri Kahwa), tasty Indian snacks are prepared on the premises. Infinitea has been serving more than 150 varieties of tea from all over the world to people in Bangalore since 2003. It was started by Gaurav Saria, the owner of four tea estates in West Bengal. The original store is situated on upmarket Cunningham Road and occupies two levels. The design gives a complete tea experience with snippets of information, pictures, and posters everywhere. There's even a tea moment from Lewis Carroll's Alice in Wonderland. A new branch is now open on 100 Feet Road in hip Indiranagar. If you can't make it to Infinitea, you can buy tea from their fabulous online tea store! Tea culture received a huge boost in Mumbai with the opening of expansive Tasse de Thé (meaning "Cup of Tea" in French), in the city's Fort district in late 2017. This Parisian-style cafe is spread over 3,200 square feet, with a spectacular marble stairway and glittering chandeliers. It's really Instagrammable! Most of the 300 or so in-house tea blends were created by one of the co-founders, who is a passionate certified tea blender. What particularly stands out is their medicinal and health properties. 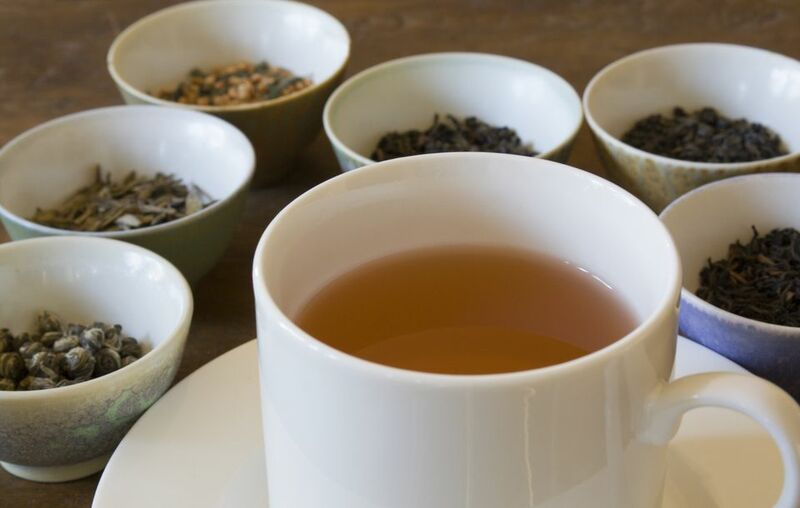 You'll find teas to address all kinds of concerns such as diabetes, weight loss, cholesterol, menstrual cramps, emotional well-being, and detoxification. The award-winning Raw Puerh Tea and Ripe Puerh Tea are also available there in India for the first time. The teas can be tasted and purchased, along with a range of exclusive bespoke tea accessories. Even the food menu is dedicated to tea, with tea-infused soups and salads, plus fancy modern European vegetarian dishes. Healthy organic and gluten-free options are provided. The Sea Lounge is considered to be a city institution for its traditional Afternoon Tea buffet, served from 3.30 p.m. to 6.30 p.m. every day. It's been taking place since the 1980s. It's not just about the tea there though. It's also about the history, culture, clientele, and architecture. This makes the Taj Palace Hotel worth a trip on its own. The Sea Lounge has old world charm, complete with a pianist and picturesque view over the Gateway of India. If you're not there for the Afternoon Tea or don't want to pay so much (it costs 1,999 rupees per person for the full buffet), there are more than 25 different varieties of tea that you can order separately from the menu. Try and get a window seat so you can gaze out over the harbor. One of the best places to eat and drink in Bandra West, the quaint Taj Mahal Tea House was established in 2015 by the company that owns India's premium Brooke Bond Taj Mahal tea brand. Housed in a rambling restored 3,500 square foot Portuguese bungalow, it brings out the romance of tea. More than 40 varieties are on offer, especially curated by in-house tea sommeliers. They're served, paired with food, on elegant bespoke crockery that's inspired by Hindustani ragas and the the Taj Mahal. Customers can taste tea, try a classic High Tea with scones, or choose to relax with a book from the collection that's strewn around. The experience isn't limited to tea either. Indian classical music performances are held there. The Aap ki Pasand Tea Gallery is a favorite among tea connoisseurs in Delhi. This colonial-style, 1,200 square foot store is located in Old Delhi, close to the Red Fort. Relax and listen to soothing music, breathe in the aroma of freshly brewed tea, and taste and buy more than 35 different varieties. Most are from Darjeeling, Assam, Kangra and Nilgiri. In contrast, the company has contemporary San-Cha Tea Boutiques in Delhi, Mumbai and Bangalore as well. They sell over 65 varieties of white, green, oolong, black and flavored teas from all over India. Plus, gorgeous tea accessories. If you're interested in tasting and buying rare teas, don't miss visiting Mittal Teas. One of the oldest tea companies in Delhi, Mittal started selling leaf tea there in 1954. Darjeeling tea is a specialty. The company has number of outlets. Mittal Stores is a small and precious tea shop at 12 Sundar Nagar Market. Another branch, Mittal Tea House, is located at 8A Lodhi Colony Market. The owner is passionate and very informative about tea. He left his engineering career to take over the family business. Inspired by the tea rooms of the Cotswolds in England, Chai Jaai is possibly the cutest place to have tea in India and one of the must-visit attractions in Srinagar. It opened in 2016, and reflects both the English and Kasmiri love for tea. You'll be able to try traditional Kashmiri Kahwa, as well as many other local and international teas. Conversations about art and literature are a bonus! Find it above Mahatta & Co. photography studio, in the Dhanjibuoy Building on The Bund at Lal Chowk. It's open daily from 9 a.m. to 9 p.m.
Dolly's Tea Shop, in Dhakuria's Dakshinapan Shopping Center, once dominated the tea scene in Kolkata. However, complaints about the service there have been ongoing for years. Fortunately, the trend in tea culture has brought some exciting new alternatives. Karma Kettle, which opened in 2017, is one of them! This classy tea store and tearoom occupies an atmospheric old bungalow at Ballygunge Place. It has been restored with a European look that combines Bengali decor elements. The name also gives it an Eastern touch (yes, you can gain good karma by serving a good cup of tea!). The owner is a certified tea sommelier. Gourmet teas, including wellness teas, are available for every mood. A special High Tea menu has been crafted to revive the ritual of afternoon tea too. You'll be able to enjoy thoughtful food and tea pairings.